What’s Needed to Build an Antique Online Store or Auction for Antique and Vintage Collectibles? Statista claims that in 2015, official annual turnover of antiques and vintage market exceeded $29.9 billion, and that’s only according to official data. At Whidegroup, we have explored the best examples of online stores and auctions specializing in collectibles. So, if you have been curious about how to build an online antique store, we will provide you with every possible detail, from the rudimental points about collectibles to the technical nuances, and development cost of your own e-store. First, we need to clarify what can be considered antiques. Material value (e.g. precious metals, rare kinds of wood, gemstones, securities, etc.). And to receive the “vintage,” title, the list above applies except the age of the item must be more than 50 years old but less than 100. Where Should You Go to Find Collectibles? Garage sales – The well-known proverb which states “One man’s trash is another man’s treasure” will never become obsolete. Garage sales were, are and will be a valuable source of items for your store. Some people luck out in finding interesting things at the garage sales. If you are one of these people, it won’t be a challenge for you to finditems for your shop. Flea markets – In most cases flea markets are now outlets for cheap imported goods, thus making collectible hunting tricky, but not impossible. The best way to heart about flea markets is to monitor online events calendars provided by several antiques publications. Another tip – don’t forget to check local calendars while travelling, so you can find out which markets you can visit while you’re on the road! Live auctions – While this source has lost a step recently, you can still hit good ones time and again. The best tip when it comes to auctions is to arrive as early as possible in order to check the items you may be interested in. This allows you to make sure the pieces are authentic and in good condition. You should note the lot numbers, and determine the maximum price you want to pay for a piece that will still turn a profit for you upon resale. Thrift stores – In order to catch a good find at your local thrift store, it is helpful to establish a rapport with employees of the store. Be nice and friendly to them, and make sure they understand well which types of collectibles you are on the lookout for. Leave your business card and ask them to call you in case items you might be interested in come in. Antique shows – Don’t neglect visiting antique shows, even if you think everything is going to be overpriced for further resale. 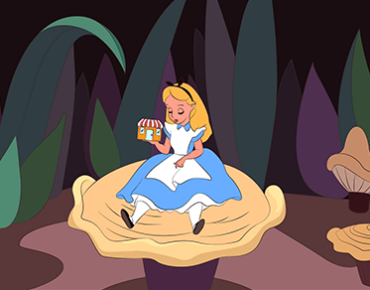 Yes, this idea is not without merit, but you may end up in coming across a seller with items that are outside their area of specialization, and therefore put them for sale at a more palatable price. You don’t want to miss the opportunity to see what you may find at antique shows. Furthermore, antique shows are great places to introduce yourself, meet new dealers, and do some market research! However, never limit yourself with a short list of sources and/or events. Always be ready to meet new people, visit new places and events. We suggest that you sometimes just test the wind and go in its direction! After you know what is considered to be a collectible, and where to find it, it’s time to solve one another issue – how do you estimate the authenticity of collectibles and price them objectively? Of course, if you are already qualified in this area, you have no concerns. If not however, it is advisable to engage with a person who is knowledgeable in estimation. This can help protect you against inadvertently buying fakes. 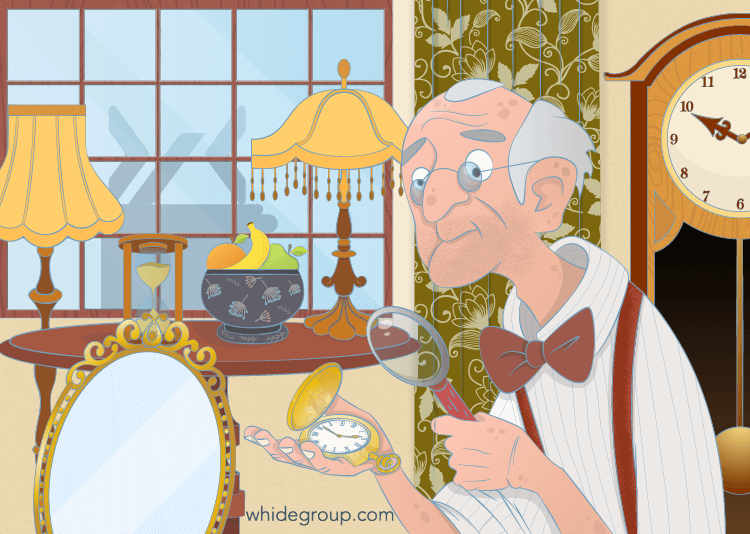 Evaluation of antiques and vintage collectibles is performed by experts called appraisers. These specialists usually have formal education in the field of economics, law, art history, or fine arts. It may be a fine art expert, museum, or auction house employee. Most of these experts form appraiser associations where they can be easily found. Some countries add certificated appraisers to the state registry. Another thing to consider is that these experts may be widely qualified, or only specialize in particular items such as books or coins. Nothing stings more than unwittingly buying a reproduction or a fake. Protect yourself from the disappointment with hiring a high-qualified appraiser. However, the list is far from complete – antiques stores are on non-stop searches for something interesting for their customers. Therefore, your potential customer always has a chance to find something unique and interesting on your website. One of the cornerstones in selling antiques and vintage collectibles online is shipping. Even your rarest and most precious items will remain available if a buyer is not sure whether the purchased product will arrive intact after shipping. With this in mind, it would be advantageous to learn some of the more popular shipping services that are most suited to transporting antique and vintage collectibles. There are many shipping companies out there! We recommend that you draw your attention to the well-known leaders in the world of shipping, that regularly deal with a wide range of cargo, such as United Parcel Service (UPS), USPS, FedEX, DHL, etc. However, regardless of your chosen carrier, particularly delicate items need particularly delicate treatment. Fortunately, companies like Craters and Freighters, uShip, and TSI offer fragile shipping services. Fragile shipping means you’ll get a pack and ship guarantee, insurance coverage based on the declared value, special packaging (e.g., cushioning, usage of corrugated box, or wood crate, etc.). The main customers of the companies listed above are museums, which are undoubtedly interested in procuring safety for the items, they ship and receive. Thus, you can be sure of white-glove delivery of your items too. Though these services have higher prices for shipping than casual companies, it’s usually worth the expense, and your customers will think so too. Founded in 2001, today 1stdibs is the most well-known antique store hosting a wide range of goods of any type and kind. 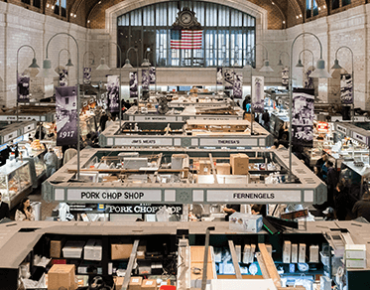 Originally a resource for interior decorators to find exclusive pieces, within a short time 1stdibs turned into an antique marketplace, bringing together more than 2,000 international dealers who specialize in design, fine art and collectibles. In 2014, 1stdibs’ gross merchandise volume was $1.1 billion, a 20% increase year-over-year. Acting as a dream for any antique-hunter, 1stdibs can offer fine jewelry (you may even find the One Ring, if you look hard enough), rare pieces of furniture (perhaps you would like an armchair dating back to the times of Louis XIV?) or vintage ball gowns (in the spirit of Scarlett O’Hara in “Gone with the Wind”). 1stdibs has a mobile app to let their fans buy collectibles everywhere. Outside of the standard sorting functions that go by name and type of item, 1stdibs allows users to sort by style (Art Deco, Rococo, Gothic, etc) and project type (family home, beach house, or apartment). It also has blog which provides visitors with some inspiration and describes new trends in design. Launched in 2013, this interior design marketplace doesn’t specialize narrowly in selling antiques or vintage, but has a meaningful collection for customers on offer. Operating in four US cities (New York, Los Angeles, Chicago, and Dallas), Viyet is famous due to its experts (who are mostly eminent alumni of big-name auction houses), who select the offerings and hand-inspect them before listing on the site. The range of the products here includes vintage and contemporary high-end furniture, accessories and rugs, paints, and chandeliers. Viyet ships nationwide, offering white-glove delivery and flexible payment plans for customers. 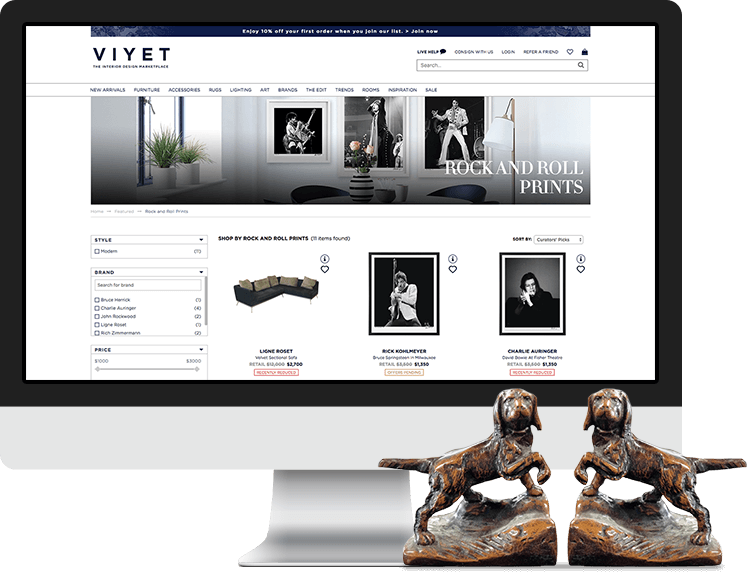 Viyet offers sorting by trends (mid-century, modern style, metallics, vintage gems) and rooms (bedroom, dining room, foyer, office, outdoor). Users can get help via live chat support and read articles by designers sharing ideas. If we are speaking about auction sales, it is impossible to pass by Sotheby’s and Christie’s without mention. The two world-wide giants in the sphere of auctions have more than 90% of the global market of antique and collectible auction sales. Being established in the 18th century, both have built their strong reputation offline, and continue doing what they do best, in online auction sales. Check out their websites to see how flawless they really are. 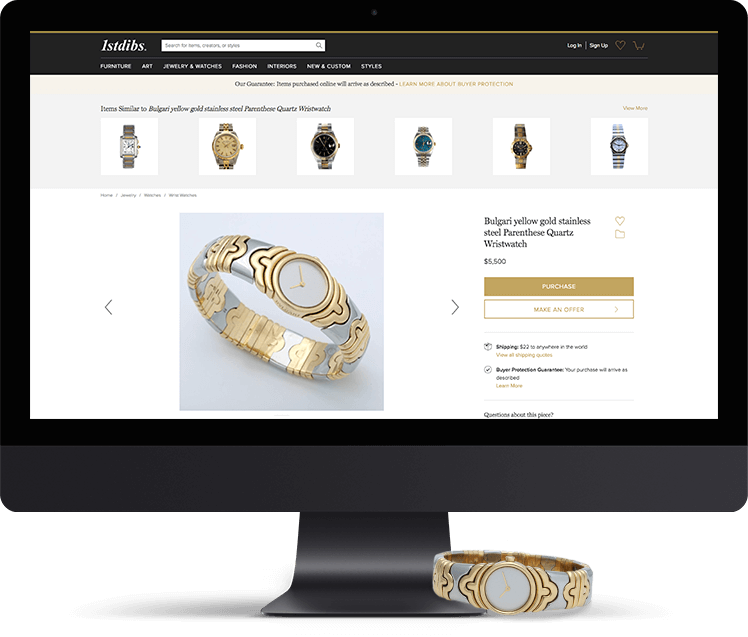 One of our projects in a similar e-commerce area is the WordPress-based jewelry store, Gilded Lab (read our case study for more information). Launched in 2016, this store allows users to not only purchase liked items, but also to create their own jewelry designs. Users can select the design, metal, and finish (matte or shiny) and also create a model including preferred gemstones and engravings. The customer gallery is always available and ready to inspire the shopper to create their own bespoken product. Antique Online Store Cost: What Does it Consist of? How much does it cost to build an online antique store? There are basically two options: you may use template themes or obtain a custom development from scratch. Let’s examine each one. Development of any online store consists of gathering the store’s requirements and their analysis, front-end and back-end development, and the server set-up. 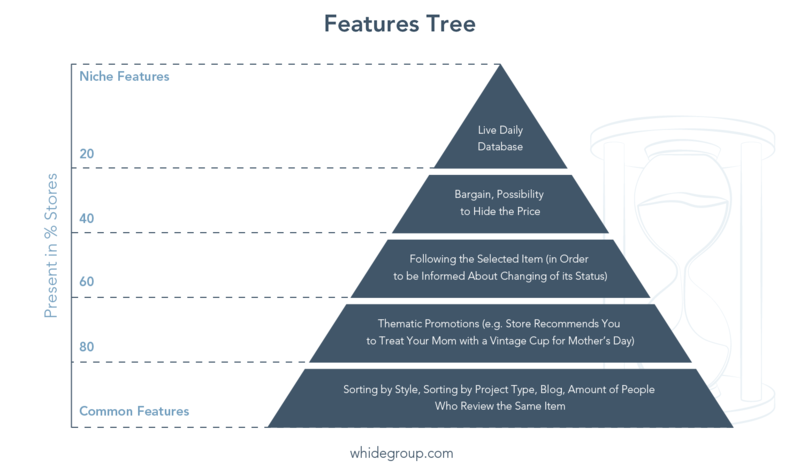 The time spent on each phase will vary depending on whether you want to develop a store from scratch or use a ready-made theme, and your planned budget. In case you need to build an online antique store from scratch – it’s expected that a fully customized shop will require more time and cost. The first step, specifications analysis and design, may take from 45 to 144 hours. Front-end development – from 52 to 200 hours, back-end 53-178 hours. 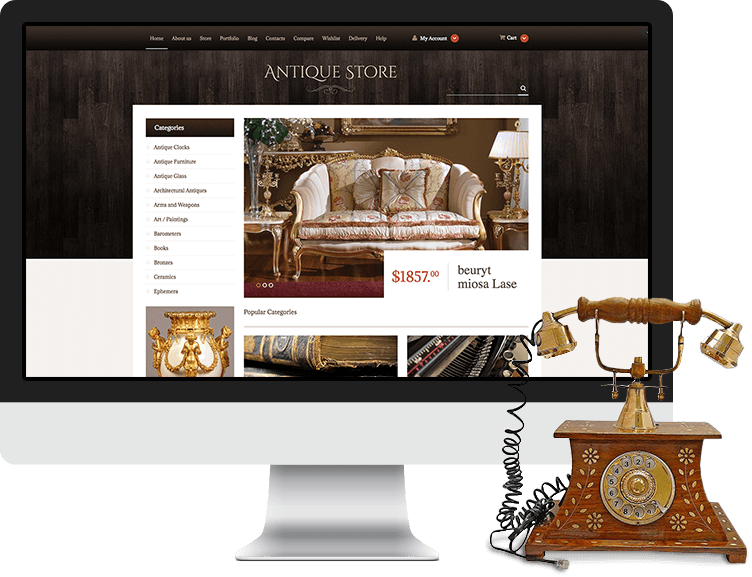 As a result we are looking at anywhere between 162 to 549 hours for the antique selling website development. If you want to use template themes (which is a perfect option for those making their first steps into this arena) – it will require significantly less time. However, your shop will not be unique, so it may be easy to confuse your site with another. The next question is about rates. Rates may vary seriously depending on the region, technologies used, and many other factors. However, there are stable trends you can consider. For example, in most cases, developer rates in the USA, Canada, Australia and Western Europe ($50-150 per hour) are higher than in Asia ($18-40 per hour) and Eastern Europe ($25-40 per hour). – the layout of this theme is decorated in brownish retro colors with a white brick background that gives a special charm to the web page. The slider and banner photos are intended to demonstrate luxury photos. An “add to cart” button chases the visitor all the way up and down. This is very convenient because it helps customers make a purchase from any place on the website. 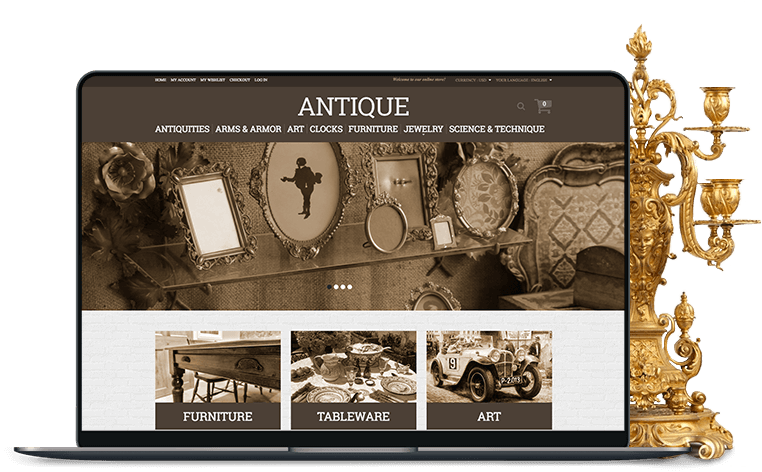 – with its 100% responsive design, and wide assortment of advanced tools and options, you’ll be able to sell antique goods online, problem-free. You can redesign this antique store template in order to adapt it accurately to your project. Its compelling look along with a minimalist layout makes the content’s view clear and easy to read. – this template will help you to make an antique website really remarkable in thanks to the huge slider and banner images. Products are represented on the white layer and supplied with green call-to-action banners. On hovering over “Featured Products” you’ll see their related star rating. – this theme has cutting edge features to help you create an appealing e-commerce website. Fancy image galleries, audio & video options, an online chat option, social sharing buttons, and a contact form – everything you need is already included. The sidebar menu makes navigation smooth and easy, as well as a back to top button and dropdown cart. Product images shown against the light background are complemented with color accents. Wooden texture adds a specifically natural and organic feel to the layout. – this fully editable theme will definitely help you illustrate your vintage collectibles on the web well. Treasuria has simple documentation, ultra-clean code, and 24/7 support. Multiple product badges, star ratings and crossed pricing are intended to help you demonstrate featured products in an attractive manner. Pre-loaded with a fully responsive design and cross-browser compatibility, Treasuria also comes with a newsletter subscription which lets your visitors get all the news and store’s updates right to their inbox. In addition to the themes listed above, you can also look at more narrowly-specialized themes intended for the creation of stores that sell furniture (Magetique – Furniture, Furniture Responsive Magento Theme, Furniture Responsive Magento Theme), jewelry (Jewelrix), pieces of art (Art Store Responsive Magento Theme, Craftstamp – HandMade Art Store WooCommerce Theme), coins (Collectible coins) and countless others. As you can see, it is not a challenge to create an online antiques shop regardless of if you are taking your first steps in this business or you’ve been engaged in it for some time. However, it is made even easier with qualified assistance. https://whidegroup.com/wp-content/uploads/vintage-bg-list-1.png-1.png 292 746 admin https://whidegroup.com/wp-content/uploads/whidegroup_logo.png admin2018-05-30 10:26:052019-03-13 12:57:40What's Needed to Build an Antique Online Store or Auction for Antique and Vintage Collectibles?What's Needed to Build an Antique Online Store or Auction for Antique and Vintage Collectibles?